Madison Bumgarner, aka Bum, rang up one of the great World Series performances of all time when he led the San Francisco Giants past the Kansas City Royals. 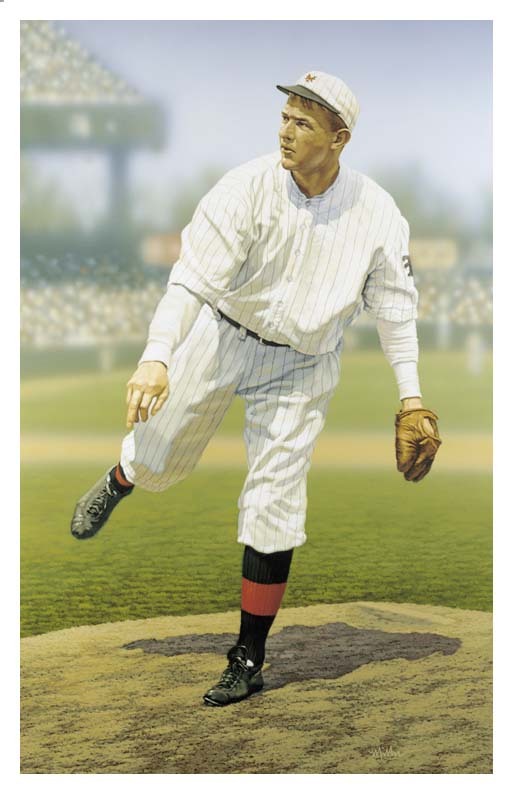 Great stuff, but MadBum and all the rest take a back seat to the New York Giants right-hander and Hall of Famer Christy Mathewson, who pitched three complete game shutouts to lead his team to a five-game win over the Philadelphia A’s in the second World Series ever in 1905. Matty, pictured above, threw a four-hitter in Game 1 as the Giants won 3-0. He followed that up with another four-hitter in a 9-0 New York win in Game 3. And he closed the deal two days later at the Polo Grounds, allowing just five hits as the Giants won 2-0. All five games in the 1905 Series ended up in shutouts – Chief Bender for the A’s in Game 2 and Joe McGinnity for the Giants in Game 4. Mathewson’s 1905 WS line was 27 innings pitched, 13 hits allowed, 18 strikeouts and one walk. He even had a couple of base hits. For his career Mathewson won 373 games, nearly twice as many as he lost, with a lifetime 2.13 ERA. He set modern National League records for wins in a career, wins in a season (37) and consecutive 20-win seasons (12), records that still stand today. Mathewson was nicknamed Big Six when sportswriter Sam Crane compared him to New York City’s Big Six Fire Company, “the fastest to put out the fire.” Matty served in France in World War I where he was a captain in the Army’s Chemical Warfare Division. While there, Mathewson was exposed to mustard gas during a training exercise. He suffered from tuberculosis the rest of his life, and died in 1925 as the World Series was being played. It’s tough to top Matty’s World Series heroics in 1905, but here are 10 who made history in their own rite, in chronological order. 2014: Madison Bumgarner evoked memories of immortal and fellow Giant Matthewson as he almost single-handedly silenced the Royals. MadBum, shown at left, stopped the red-hot Royals and their eight-game playoff win streak in the opener, and then pitched a complete-game shutout in Game 5 for his second win. With the season on the line in Game 7, he threw five innings of two-hit ball to earn the save in a 3-2 Series clinching win. Overall MadBum allowed nine hits and one run in 21 innings, an 0.43 ERA. 1991: Jack Morris was at his absolute best in Game 7 of the 1991 World Series. Refusing to come out of the game, the Minnesota Twins finally rewarded his efforts when Gene Larkin’s 10th-inning, walk-off single game the Twins a 1-0 win over the Atlanta Braves. In outdueling John Smoltz of the Braves, Morris allowed seven hits over 10 innings and struck out eight. Morris won Game 1 of the Series and had a no-decision in Game 4. He was 2-0 with a 1.17 ERA in the Series. 1988: Orel Hershiser of the Los Angeles Dodgers maintained his late-season roll with two stellar performances in the World Series. After setting a new record with 59 consecutive scoreless innings in September, Hershiser shut out the heavily-favored Oakland A’s 6-0 in Game 2, then won the Game 5 clincher 5-2 with another complete game. His totals – 2-0 record, 18 innings pitched, 7 hits, 17 strikeouts, and 3-for-3 at the plate. 1968: The St. Louis Cardinals were big favorites, and when Bob Gibson struck out 17 Tiger batters and beat Detroit 31-game winner Denny McLain things didn’t look good. Mickey Lolich to the rescue. The portly southpaw beat the Cardinals 8-1 in Game 2 and hit a home run as well. With the Tigers down three games to one, he won Game 5, 5-3. Finally, pitching on just two days rest, Lolich won his third game of the World Series, outlasting Gibson and the Cards 4-1 in the Game 7 clincher. 1967: The 1967 World Series belonged to St. Louis Cardinals righthander Bob Gibson who doused the Impossible Dreamers, the Boston Red Sox. Gibson was 3-0 with 26 strikeouts and a 1.00 ERA in three complete game showings. He won Game 1, 2-1, and pitched a five-hit shutout to take Game 4. After the Red Sox rallied to tie the Series, Gibson homered in a 7-2 win in the Game 7 Cards wrap. 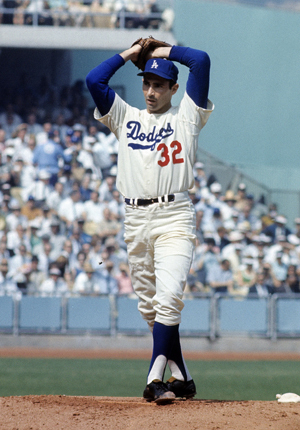 1963: During a five-year stretch in the early and mid 60s, Sandy Koufax was as dominant as any pitcher has ever been. And the Los Angeles Dodger left-hander, pictured right, dominated the Yankees in 1963, setting a WS strikeout record with 15 Ks to win Game 1, and completing the sweep with a 2-1 victory and eight strikeouts in Game 4. 1957: Yankee castoff Lew Burdette returned to haunt the Bronx Bombers in the 1957 World Series. The Milwaukee Braves right-hander won Game 2 and then proceeded to shut out the Yankees in Game 5. With the Series on the line, Burdette threw another shutout in Game 7 at Yankee Stadium, winning 5-0. Overall, Burdette was 3-0 and allowed just two runs in 27 innings for 0.67 ERA. 1933: The last time Washington was in the World Series, the Senators lost to the New York Giants in five games. New York’s screwball artist Carl Hubbell won the opener 4-2, striking out 10. 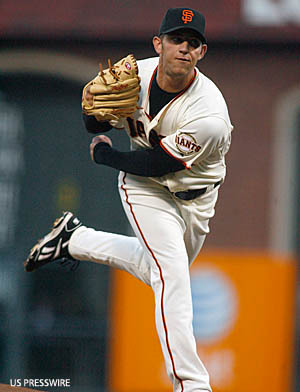 In Game 4, Hubbell went all the way allowing eight hits as the Giants won, 2-1 in 11 innings. Although Hubbell gave up three runs in the two games, none of them were earned. His ERA in 20 innings was 0.00. 1926: Grover Cleveland Alexander won 373 games in his career, tying Christy Mathewson for the most all-time in the National League. And he was nearly as good as Matty in the 1926 World Series. Pitching for the Cardinals, Old Pete beat the New York Yankees in Game 2, and when he threw another complete game to win Game 6, 10-2, the 39-year-old future Hall of Famer probably figured he was done for the Series. Not so fast. With the Cardinals in front 3-2, two outs and the bases loaded in the seventh inning of Gam 7, Alexander was called on to face Tony Lazzeri. After a loud foul down the left-field line at Yankee Stadium, Alexander struck out Lazzeri. He threw hitless ball the rest of the way, saving the Cardinals first World Championship. 1921: New York Yankee right-hander Waite Hoyt matched the mighty Matty in the first subway Series, with all games played at the Polo Grounds. He pitched 27 innings against the cross Harlem River Giants, and had a 0.00 ERA. Hoyt pitched a five-hit 3-0 shutout in Game 1 in the Yankees first World Series game ever. He allowed a pair of unearned runs in in Game 5 and won again, 4-2. In the finale, Game 8, Hoyt, pictured at left, gave up an unearned run on an error by shortstop Roger Peckinpaugh in the top of the first and then blanked the Giants the rest of the way. However the Yankees couldn’t score and lost both the game, 1-0, and the Series, five games to three. 2001: Randy Johnson, Kurt Schilling, two-headed monster, combined to win all four games, three by the Big Unit, as the Arizona Diamondbacks beat the Yankees in seven games. 1960: Whitey Ford, the winningest pitcher in World Series history with 10, hurled complete game shutouts in Games 2 and 6 and was well on his way to breaking Babe Ruth’s record for consecutive scoreless innings. 1956: Don Larsen. The Yankee righty pitched a perfect game against the Brooklyn Dodgers, nuff said. Larsen got bombed in Game 2, but so what. He’s a perfect fit.